Shiga-toxin producing Escherichia coli (STEC or VTEC), e.g. E. coli O157, E. coli O145 or E. coli O104 are known to cause diarrhea, hemorrhagic colitis (HC) and the potentially fatal hemolytic uremic syndrome (HUS). STEC are most commonly transmitted through raw ground beef, raw or inadequately pasteurized milk, sprouts and vegetables. 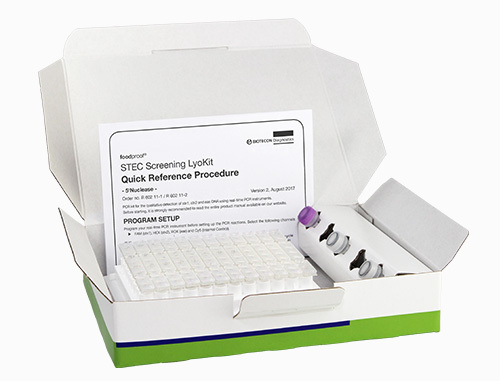 The foodproof STEC Screening LyoKit detects the Shiga toxin genes stx1 and stx2, including the allele stx2f, as well as the adherence-factor intimin gene (eae) in one multiplex real-time PCR reaction. The detection of stx2f is currently not possible using the STEC ISO / TS 13136.